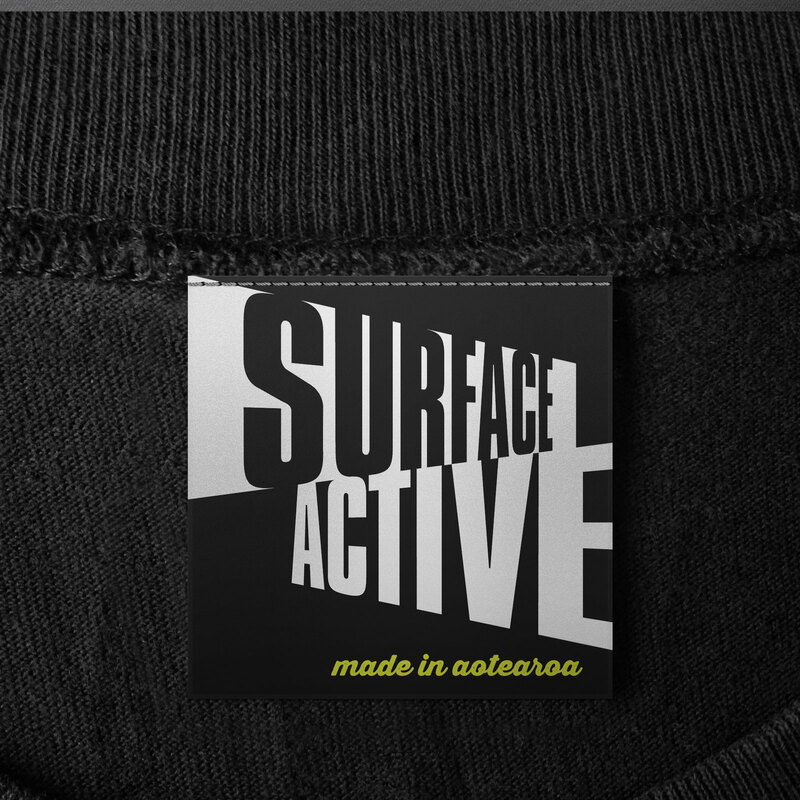 Surface Active art-to-wear: T-shirts in the spirit of fun. 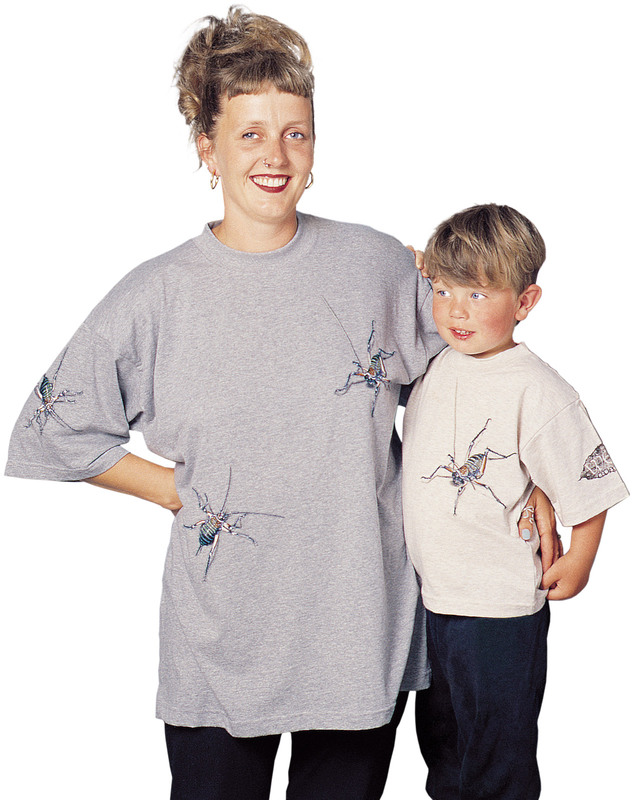 By the mid 1980s T-shirts had become hot promotional items, garments on the outskirts of fashion, and a relatively new medium for the Graphic Designer’s art. What had for a long time been considered a poor medium for Graphic Design grew to an almost essential one. All you have to do is walk down the street anywhere in the world since the early 80s to see what a ubiquitous promotional vehicle they have become. If you mail out 100 potential clients a direct mail brochure perhaps 200 people will see it. But mail out, or better yet, sell 100 T-shirts, and assuming they’re at all decent looking, you launch 100 walking billboards. Promotional teeshirts take this walking billboard concept one step further by being clothing that promotes products, services, cultural and ideological views in such a way that the wearer is willing to be identified—whether through a sense of aesthetics, humour, social responsibility, or irreverence, or loyalty to a watering hole, cultural institution, environmental organisation or charity. People are willing to wear someone else’s message because they feel it says something about themselves—which is the essence of fashion. 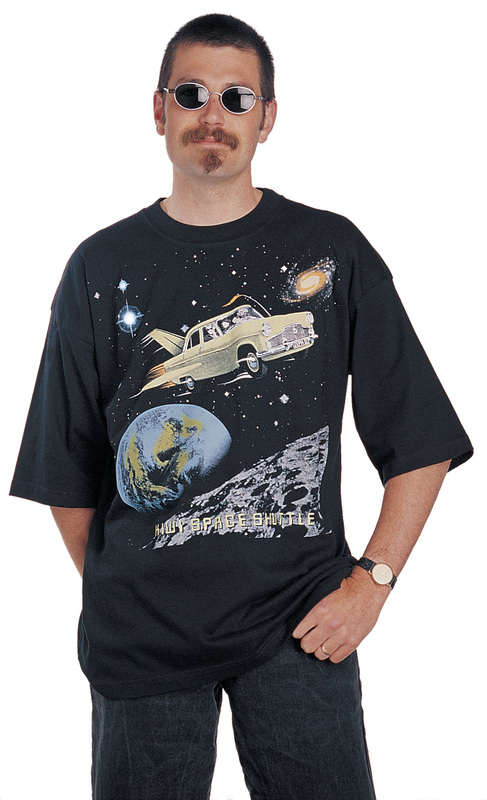 ‘Kiwi Space Shuttle’ T-shirt, six colour print on grey marle fabric. 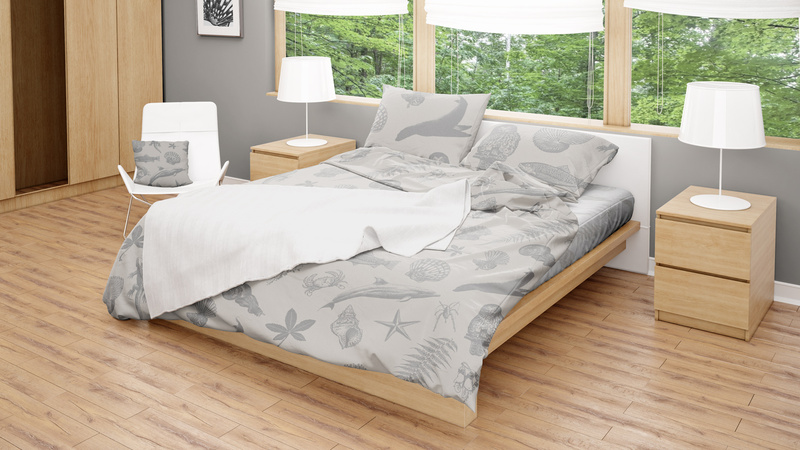 Placement; six colour front, one colour woodcut around hem front and back. When you are printing on cotton fabric with seams you cannot get the kind of fine detail you can printing on paper. 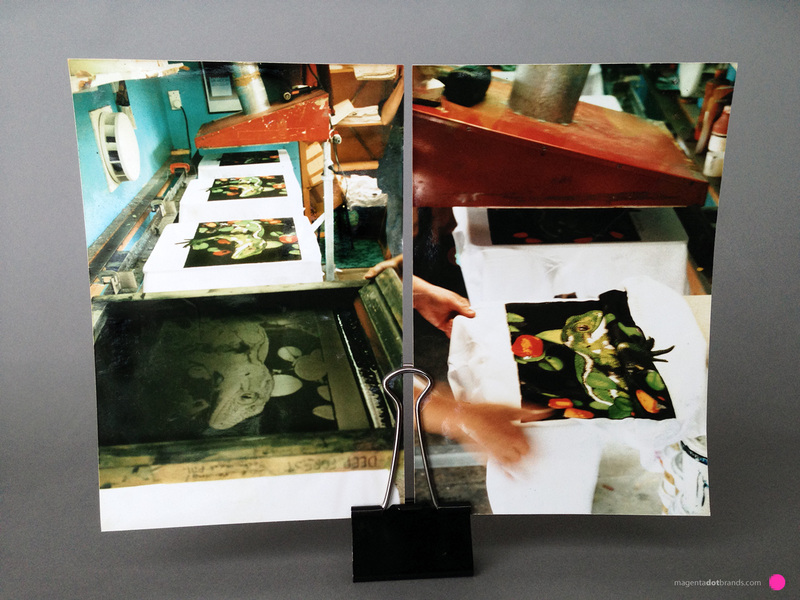 The fabric absorbs the inks or dyes and the colour spreads through the fibres—the fabric equivalent of dot gain. Surface Active print shop, Jewelled gecko hand pulled eight colour Teeshirt printing in progress. 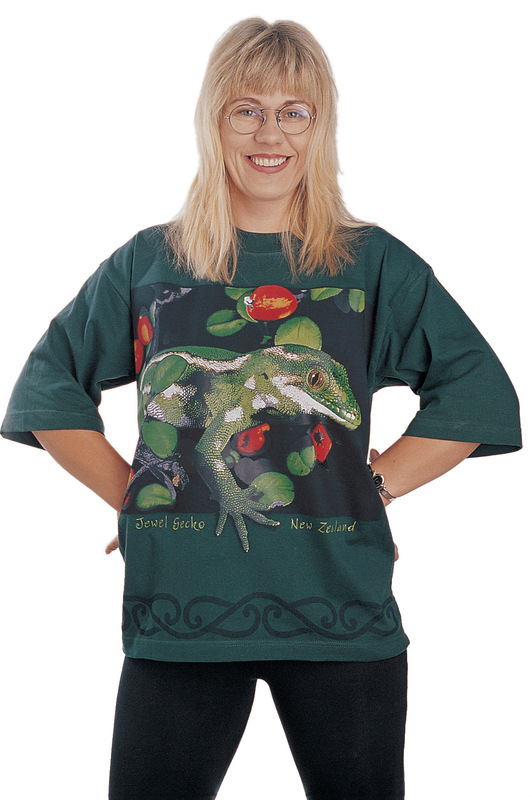 ‘Jewel Gecko – New Zealand’ eight colour T-shirt print on dark green fabric. 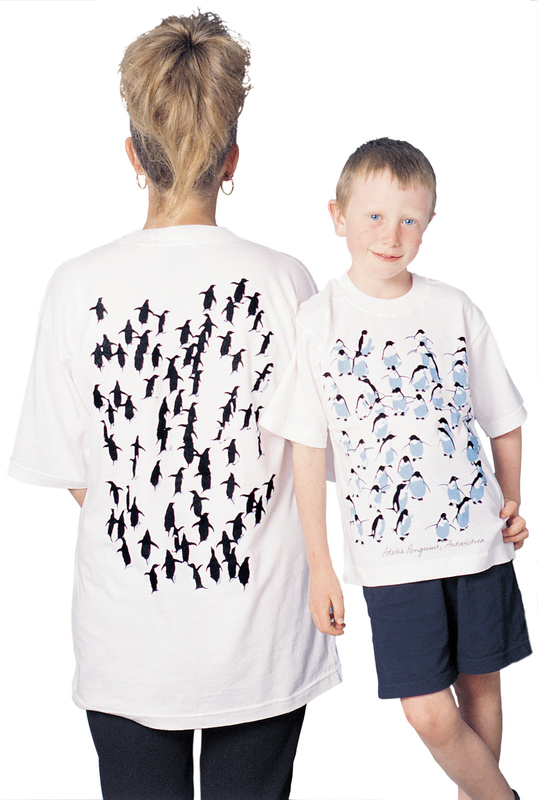 Placement; Eight colour front print, one colour kowhaiwhai print front and back around hem. The other reason other than avoiding toxic (and highly hazardous) solvents that are used for printing “Plastisol” inks, and for selecting water based inks and dyes as the better option is that of the “hand” or feel of the ink. Water-based inks have a nicer feel to them but they are more difficult to work with as they easily cure, “dry in” or clog the stencil especially in peak demand hot summer weather, rendering it useless and in need of remaking. 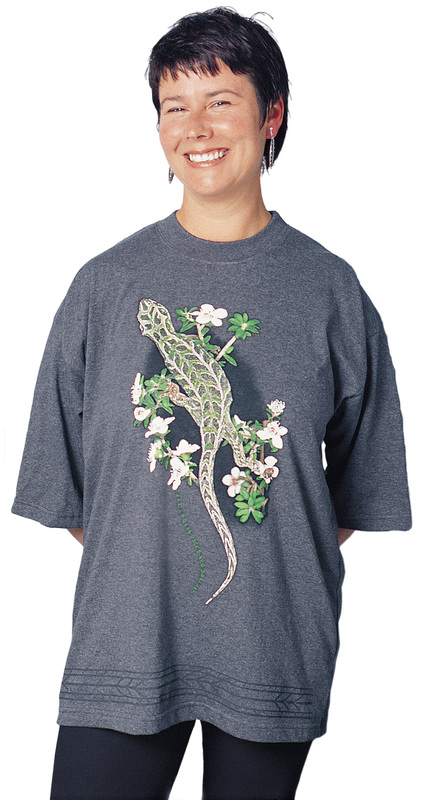 Waterbased dyes have no “hand” to them as such as the screenprint literally dyes the light coloured fabric. We developed a custom in-line sequential printing methodology, rather than rotary print methodology in our back-shed “sheltered workshop” to successfully overcome the drying-in drawback of waterbased printing dyes and Supercover inks. It was achieved by way of additional manual labour and an innovative use of my own design of screen holding humidifier boxes for keeping the ink and screens moist between print runs. If your dark shirt design has a lot of solid light ink coverage you end up making something that has the feel of a bullet-proof vest when you’re wearing it. We avoided this by planning our designs to combine both ink and dye passes, colours darker than the fabric colour are dyes, lighter ones are super-opaque acrylics, all required flash curing between. The other huge benefit with water-based inks, aside from wash-up with water, and their “thinners” being water, is that the finished garment once flashed off to the point of being touch dry is given a final cure in just 20 minutes in a domestic tumble dryer rather than a 6m long high-tech curing oven. I developed a variation of drawing wildlife art for reproduction from classic zoology methods, using mixed media, charcoal pencil with pen and ink on coquille board to achieve a crisp “line and tone” effect from one colour “line” images. As with other some portfolios on the site Archive the over 40 designs included here are collected from the period between 1988–2002 of our Surface Active printed garment editions. I have made no effort to force the shirts into defined categories; rather, I present them in a manner intended to inspire and entertain—an approach appropriate to the spirit of fun that T-shirts represent. 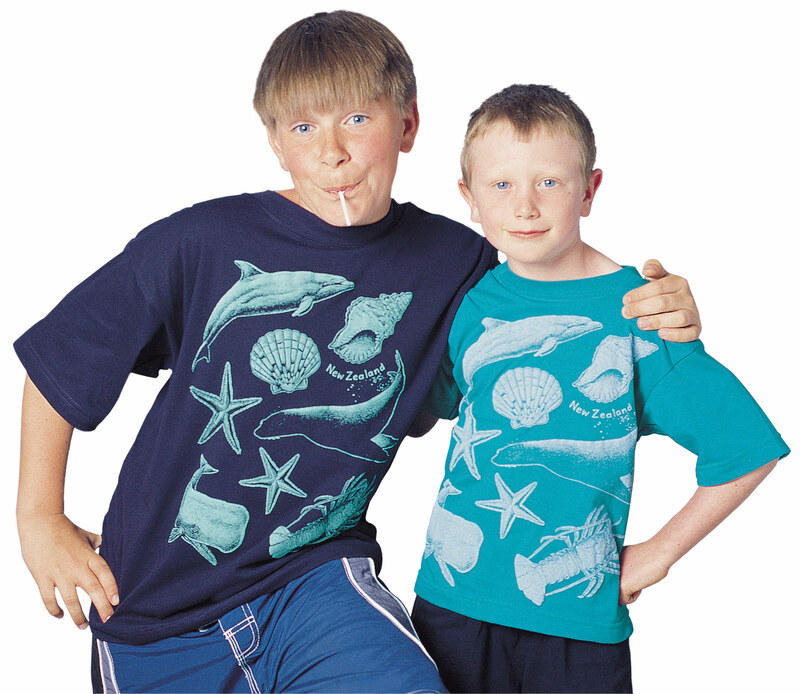 In that light-hearted vein a shout-out must go to our T-shirt models from back-in-the-day, the kids are all 20-or-30-something now at time of writing. Our compliments and lasting gratitude are also due to their T-shirt modelling parents, our friends. SurfaceActive employed most of them as our highly-trusted sales crew selling from our stall at the weekend Christchurch Arts Centre Market, come rain or shine, year-round 1988–2002. They have beautiful art work. I am still wearing my T-shirt I got in Nelson in 1998, now want new ones. 🙂 Well made.